Thanks for visiting our Bluey Travel website. Since 1999 we have been helping people organise and book self-drive holidays through the Northern Territory and Kimberley, and of course you can’t leave out the great drive on the Gibb River Road. In that time we have literally helped thousands of customers travel millions of kilometers. Click on About Us to find out more. Whether you are planning to explore Kakadu National Park or the stunning gorges of the Kimberley along the Gibb River Road, we recommend focusing on getting the itinerary right. More so than any other destination, planning your itinerary correctly can make a massive difference to your experience. We can’t stress this enough! If you only have a limited amount of time we recommend picking the best attractions each day and immersing yourself in the experience rather than trying to see everything. For a memorable holiday that is relaxed and well informed, check out our popular packages or Contact Us to plan and book your own tailored itinerary. 14 Day "Top End & Kimberley Highlights"
21 Day "Ultimate Top End & Kimberley"
Overview: The Northern Territory & Kimberley are some of the most spectacular regions in Australia. Highlights in the Top End include Darwin, Kakadu, Litchfield and Katherine Gorge. The Kimberley is synonymous for Broome, the Bungle Bungles and the attractions off the Gibb River Rd such as El Questro, Emma Gorge, Windjana, Bell Gorge & Tunnel Creek. 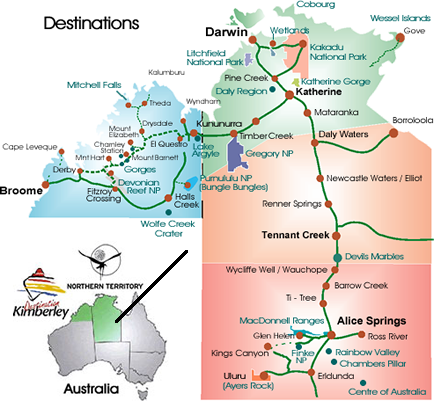 If you are planning to vist the Red Centre make sure you include Alice Springs, Uluru, Kings Canyon and the McDonnell Ranges. Roads: The roads in the Northern Territory and the Kimberley range from first-class, all-weather sealed roads such as the Stuart Highway through to iconic 4WD tracks such as the Gibb River Road. To make a general statement about the condition of any dirt road in the region would be misleading because road conditions could vary from good condition after it has just been graded to very rough with scours, washouts and water over flood ways and creek crossings if there has been recent rain. For more information on tackling the Gibb River Road click here.